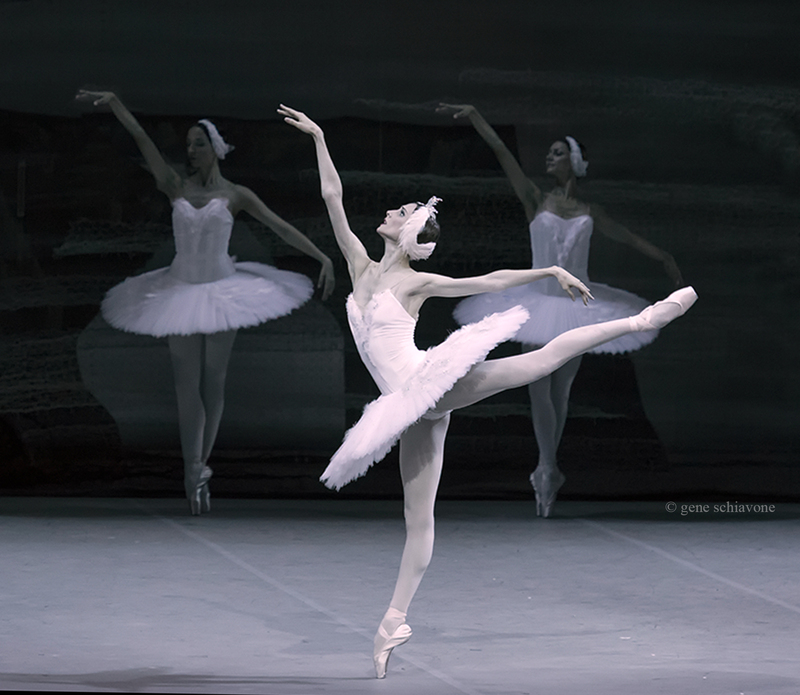 Following several nights of opera, the Bolshoi Theatre opened its 243rd ballet season on 18 September with the requisite performance of Swan Lake, featuring Svetlana Zakharova and Denis Rodkin in the leading roles. While no one, not even Soviet ballet icon Yuri Grigorovich, can improve upon the beauty of Petipa classics, Grigorovich's choreographic talent comes through in the sections devoted to male dancing and his ability to pare down the classics to the bare minimum. There are elements that he retains in faithfulness to Petipa: the Bolshoi Lake style features soft elbows for the Prince, basic adherence to the "original" choreography for the White and Black adagios, and a focus on large corps sections throughout. Purists should be forewarned: the musical score is cut in numerous places so that 3 hour and 15 minute traditional 3-act version that runs at the Mariinsky Theatre is now just 2 acts that finish in 2 hours and 40 minutes. The Bolshoi orchestra sounds exponentially better under Tugan Sokhiev, who like colleague Makhar Vasiev, began his career at the Mariinsky before becoming Music Director and Principal Conductor at the Bolshoi. One could almost believe it was the tightly played Mariinsky orchestra at the hands of Mr. Sokhiev whose conducting lends depth and intensity to the score. Denis Rodkin flew on stage in a series of floating jetés in his first entrance, just several measures into the score in this version. This early entrance of the leading character wastes no time on atmosphere -- indeed, we plunge straight to the core of the libretto. Decorating the stage behind Rodkin, 12 couples danced the waltz inside the royal palace (another departure from the Petipa version, where the first scene is set outdoors). Near the end of the waltz and set in a triangular formation, the male corps de ballet perform a set of entrechat six with Rodkin leading them downstage in one impressive display of synchronicity. Next, Rodkin himself (instead of a different male soloist) joins two ladies in the Pas de Trois. Anastasia Stashkevich and Kristina Krevtova displayed beaming smiles and fitting attack in their respective segments. Stashkevich's variation, also fully rechoreographed, features a "lunge-tendu" sequence which she adorned with flirtatious épaulement. After the Prince receives his birthday gift, the swans enter. Here the choreography requires them to look at the audience in the arabesque sauté-pas de chat crossing, which works well for rehearsing straight lines in the mirror, but appears differently on stage. The Act II national dances brought pleasant impressions from fresh-faced Tatiana Tiliguzova, also previously with the Mariinsky Ballet, whose long neck and plush port de bras filled out the slow tempo of the Hungarian princess' dance with full-bodied lyricism, then shifting into a lightning speed pas de bourée/piqué turn sequence. She was followed by Anna Tikhomirova, a spitfire who seemed in her element here, adding flashy spice to the Spanish dance, and Maria Vinogradova who literally hung in the air in jumps with the tambourine in the Neopolitan dance. A new face, Maria Semenyachenko, danced the Polish princess with attention to detail, her angularly arched feet stepping precisely in each bourrée. Grigorovich combined the purpose of the national dances in Act II: the female dancers from each country also serve as the Prince's potential fianceés, whereas in other versions the princesses are separate roles. Our heroine, Svetlana Zakharova, perhaps an epitome of textbook classicism at times, bourréed onstage with enviable purity of line in Act I. In the White Adagio, nearly unchanged from Petipa, she etched perfect positions, her penchées stretching into the 180-degree splits that have become de rigueur in the role now. The four little swans appeared well-rehearsed, if mechanical, while the four large swans swept through the reach of their limbs, fulfilling each note of the score with lyricism. In the Act II pas de deux, Zakharova warmed up in her expression. Her run towards Rodkin displayed urgent confidence as she shot a predatory glance at him before the penchée in their duet, certain of her target. In her variation, the hops in arabesque rotating en dehors maintained a steely structure (she managed to pull herself onto centre after the second set by focusing forward), and her tombé coupé jeté manège at the finish cut sharply through the air. She managed 29 fouettés to rave applause from the hall. In Act II, Rodkin highlighted the double cabriole in his variation with soft elbows, echoing the style of his former coach, Nikolai Tsiskaridze. To his credit, the Prince's pantomime throughout the two acts was clear, from his surprise at the beloved birthday gift, to his despairing grief after the Black Swan pas de deux, as he realised the gravity of his mistake. While the Bolshoi is not typically prided for their corps as much as the Mariinsky, current Artistic Director Makhar Vasiev should be commended for the corps' increasingly straight line formations, a challenge that is slowly becoming what should be a constant source of pride for a troupe of this caliber in the months to come. Viewing a Mariinsky import who has made her name in the country's capital in a Petipa remake is an eye-opening endeavour for classical enthusiasts, and in this viewing, Ms. Zakharova displayed her devotion to the classical canon. It will be interesting to see what lies in store for the rest of this Bolshoi season which, for all intents and purposes, is off to a good start. All photos provided with the gracious courtesy of Gene Schiavone.